Dreams are interesting things – our modern age either makes too little of them or too much of them – but mostly, we believe our dreams are about us and about the inside of our heads. Those who make too little of their dreams write them off to anxiety or other stresses of the day – wish fulfillment – or a variety of other mundane causes. Those who make too much of them remind me of those who are Western believers in reincarnation – they always seem to have been somebody famous – while their dreaming counterparts always try to find the meaning of the universe or something equally significant in the slightest symbol. I don’t mean to sound so jaundiced on the subject, but I once spent a week at a Jungian Conference (long ago and far away and definitely in a different galaxy). Such a week can make you afraid to go to sleep. But dreams certainly have a signficance – and as shown in Scripture, they can indeed be sent by God. My favorite Biblical dream is that of Jacob, who sees a ladder stretching into the heavens and angels going up and coming down. His reaction upon waking was to attribute the dream to the place in which he was sleeping:”This is none other than the gate of heaven and the house of God!” And, of course, as the good patriarch that he was he erected a stone and anointed it with oil. Years ago, some years before I became Orthodox, I had a dream in which I was in a Church. 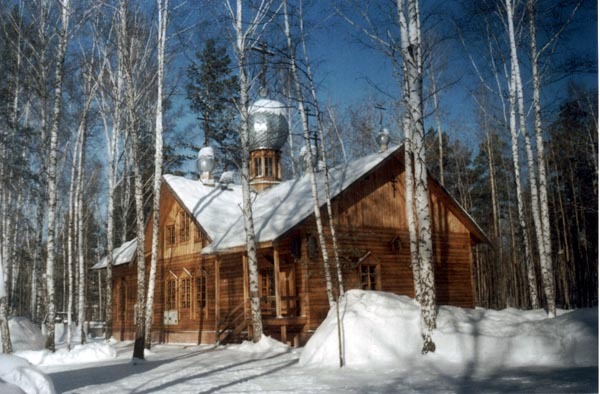 Its construction was of log-timber and it was obvious to me that it was an Orthodox Church. There were icons and lampadas, and a sizable crowd of people. What fascinated me about this dream-Church were its many rooms. Everywhere you went there were steps up and steps down and rooms here and rooms there and all of them full of people and icons and lampadas and the faint smell of incense and the low murmur of worship and prayers. I remember the dream lasting quite a while, but with nothing more significant than the many rooms – and how it felt to be there. That feeling is what remained with me when I awoke and remains with me to this day. The description I have given is probably the best I can do, for I have no words for how it felt, other than to say it felt like an Orthodox Church – but an almost endless Orthodox Church. Having written a week or so back about the Christian life lived in a one-storey universe, I am reminded of that Church in my dream. It was certainly a one-storey Church – and yet it constantly opened up into place after place. This week I am studying the painting (or writing if you prefer) of icons. They are often called “windows to heaven.” In the Church of my dream, or certainly within the metaphor it has left in my heart, I also think of them as doors to another room. Each saint, each icon of Christ or of the Theotokos, opens not just to heaven, but to ever deeper rooms within the world in which we inhabit. To spend time with an icon is not to visit some other place only to return to where you were before, but is to enter another room though you never left where you were. The world is changed, enlarged. What seemed small and insignificant is suddenly expanded and filled with meaning. The finite is filled with the infinite and becomes inexhaustible. I remember waking from my dream years ago, and aching with a hunger for something I could not name. But I know now that it was a hunger for heaven – and not for a heaven somewhere else, but for heaven on earth – which in Orthodox dogma – is indeed the Church. Please don’t forget to talk about evil in the one storey universe! I don’t know–it seemed like something that fit with your post. I am grateful for patient readers – I’m in a retreat this week, painting icons, and I get about 30 minutes each evening to check the site and deal with email. So it will be a slow week. Nathaniel, I’ll try not to forget the question or the subject. I am learning a lot – including how much I do not know – and even more how little my fingers know. My respect for iconographers has soared. I hope to get a post up tomorrow sometime. God bless all. Fr. Stephen, you seem to be pointing to the “prophetic” quality of some dreams. I have no doubt that God prepares us through such dreams, even though we may not understand them at the time. About 15 years ago I had a dream in which I was vested as a priest and standing behind my bishop, preparing to process into the church. Suddenly, off to my right appeared a luminous milky white pearl. It was exquisitely beautiful and I knew somehow that it was the “pearl of great price”. In order to take hold of it I had to step out of the procession of priests and turn my back on my bishop. At the time the dream disturbed me, but looking back I realize that it symbolized the reality which I faced in The Episcopal Church. Alice, I am grateful you sought the pearl of great price – and I understand the price was indeed great. May God bless. I think you have put words to something that I had experienced and identified but couldn’t fully express. That hunger, which drove all the seeking, and all the strange rocks I overturned in the process of seeking (you know, the charismatics, contemporary Christian music, popular evangelical preaching), before finding what I needed to sate that gnawing emptiness…heaven on earth…the Church. Good stuff. He was a Boy Scoutmaster and I often helped with his meetings which were on Wednesday nights. I was sure that the dream was somehow tied into the Scout meetings. But the dream was so real that to this day it is as though I just woke up. And for years I wondered at the vividness. In 2005 he died suddenly. He was not Orthodox and had only in the last few years left his agnosticism. The 40th day after his death, I decided to pray and fast all day for him. That morning at work, our devotion ( I work in a Christian bookstore) was the verse “Be anxious for nothing, but in all things with prayer and thanksgiving let your requests be made known before God.” Later that day, while putting our new stock, I saw we’d received a plaque with the verse from Psalm 91 “He will give his angel charge over you.” This was significant because I had given this to him and asked him to memorize it as he had a somewhat dangerous job in the military. I went to vespers certain that I would come away with a feeling of peace for him. Nothing. I came away empty. The following morning, our devotion was “Blessed are they that mourn for they shall be comforted.” Then that weekend, I realized that the day I prayed and fasted, the 40th day, was a Wednesday. I felt that 12 years earlier, before I was Orthodox, God showed me that I would take care of my borther in a way no other relatve could on that Wednesday night. PS I was able to help his wife (they were divoreced and estranged from other family) and children in that as a military wife, I could guide them through things they needed to file for insurance and other VA benefits. There is a great mystery in our prayers for the departed – as is stated in the Church’s teaching: “they are of benefit.” That rather short statement contains a world of truth. Without being filled with details over the mechanics of our life after death – it speaks volumes about the mercy of God and importance of our prayer. May your brother’s memory be eternal and may comfort you continually.